In a brief article in Commentary, Philip Hamburger summarizes his case against IRBs, made in much greater detail in his 2004 article, “The New Censorship: Institutional Review Boards," Supreme Court Review (2004): 271–354. In this version, he argues that the regulation of human subjects research "is the most widespread and systematic assault on freedom of speech and the press in the nation's history. 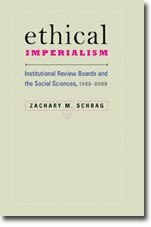 McCarthyism was more overtly political, but IRB licensing is more pervasive and methodical, and its consequences are far more lethal." I appreciate Hamburger's bringing this issue to the attention of readers outside of universities, but such a brief article for a general readership necessarily simplifies and perhaps distorts some of the details. For example, Hamburger writes, "almost all HHS officials, other than the secretary of HHS, are protected by the HHS regulations on IRBs. So too are members of IRBs. As a result, empirical academic critiques of HHS decision-making, and even of the IRB licensing, are practically impossible." I'm not sure where this is coming from. While the § 46.101(b)(3) exemption for research on public officials is vague, SACHRP has noted that "university faculty, public school teachers, and police officers in general are not considered to be elected or appointed public officials, whereas mayors, governors, school superintendents, school board members, and police chiefs are considered to be elected or appointed public officials." If interviewing a school board member is exempt from review, I would imagine that a great number of HHS officials are likewise fair game, and I've never heard of an IRB denying a researcher's claim of exemption for such research. This is not to say that HHS decision-making is at all transparent (who drafted the ANPRM? Who is working on an NPRM? Is anyone? ), but I don't see IRB regs themselves as the obstacle. Hamburger concludes his essay with the obversvation that the First Amendment guarantees freedom of speech and of the press; "All that Americans need is a judge who is willing to enforce the Constitution." While judicial review might challenge the IRB regime, I wish Hamburger had mentioned the ANPRM and the efforts--however obscure--by regulators to address the problems he has noted.